The ten chef finalists of the Farm to Table Chefs Taste Challenge participated in an "Ingredient Draft" to select the products they will use to create their showcase dish for the August 19th competition. The ten chef finalists of the Farm to Table Chefs Taste Challenge participated in an "Ingredient Draft" to select the products they will use to create their showcase dish for the August 19th competition. The chefs, who hail from across the nation, will compete to create the best dish that utilizes farm-fresh items from a pantry of seasonal ingredients donated by state agricultural departments. The event will be emceed by Chef Kevin Belton of the New Orleans School of Cooking and the PBS show “New Orleans Cooking with Kevin Belton.” Participating chefs’ dishes will be judged by a panel of industry-renowned judges. Confirmed judges include Tory McPhail, Executive Chef of Commander’s Palace; Gary Prell, Vice President Culinary Development, Centerplate; Izabela Wojcik, Director of House Programming, The James Beard Foundation; and Chef Nedra Harris, Author and former “Hell’s Kitchen” competitor. The top two dishes will be selected for Gold and Silver Chefs Taste Challenge awards. A “Fan Favorite” award will also be presented based on voting from dinner attendees. All ten selected chefs will receive national recognition for their participation in the Chefs Taste Challenge dinner event. Tickets start at $129 and include tastings of the menus prepared by the competing chefs, wine/beer pairings, souvenir wine glass, and a voting card to determine a “fan favorite” dish. Upgraded experiences and sponsorships are also available. The “Foodie” level is $189 per person or $1,295 for a table of eight, and includes all benefits mentioned above, plus a seated dining option overlooking the chef stations, early access to food and wine, admittance to a special VIP section with exclusive beverage service, starter glass of champagne, and a chef or wine connoisseur to guide the tasting experience. Limited tickets are also available for the “Gourmet” experience, which is $599 per person and includes all of the “Foodie” level benefits, plus the opportunity to assist one competing chef with food preparation, a special announcement of sponsorship at the event, and a sponsor listing on the Farm to Table conference website and show guide. 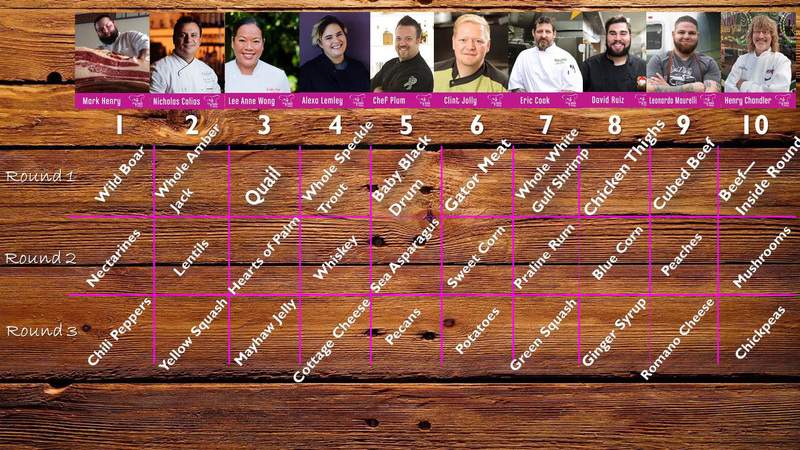 The Chefs Taste Challenge is produced by the New Orleans Ernest N. Morial Convention Center and is held in conjunction with the Farm to Table Experience, taking place August 18-20, 2016. F2Te explores the cultivation, distribution and consumption of food and drink sourced locally to globally. For more information on F2Te, please visit f2texperience.com. The second annual F2T Chefs Taste Challenge is a fun, fresh take on a food competition aimed at broadening awareness for the use of fresh, healthy, sustainable ingredients in preparing food. This event will provide a platform to feature ten of America’s best farm to table chefs from across the country. The CTC is held in conjunction with the Farm to Table Experience. F2Te explores the cultivation, distribution and consumption of food and drink sourced locally to globally. http://www.chefstastechallenge.com. The Farm to Table Experience (F2Te) is the premier annual gathering in the south exploring cultivation, distribution, and consumption of food and drink sourced locally. The theme for this year’s event is “Food for Thought” and will feature Tastings, Interactive Displays, Hands-on Workshops, Chef Demos, Educational Sessions, and more! Visit ftexperience.com for information.